Billy Joel said, "wherever we're together that's my home." Maya Angelou said, "I long, as does every human being, to be at home where I find myself." But wherever we consider home, may there be peace and prosperity there. These words in Psalms were originally written about Jerusalem. I'm going there this summer. 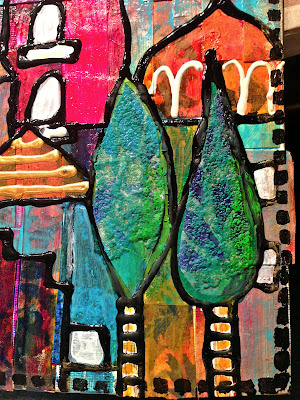 I made this piece using prints created with my gelli plate, which I collaged in strips of rectangles and squares. 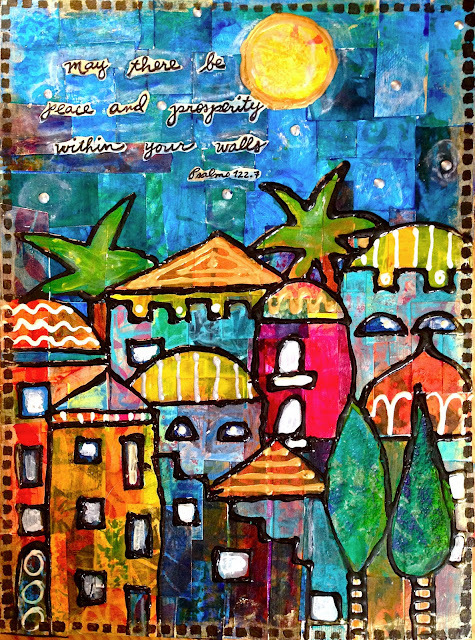 and linking to the blog hops at Paint Party Friday, Art Journal Every Day, and June's Colorful Gelli Party. Thanks to Eva, Kristen, Julie and Carolyn for providing such fun places to see beautiful art! Love both your pieces. Thanks for sharing the how-to. I love the fluidity of your work. That is an amazing pen...the texture is so alluring. Your colours are absolutely appealing. Home is always calling me too! Thanks for sharing your thoughts and process. Lucky you to be going to Jerusalem! I don't know if it is just me, but I see faces in all those buildings. Love the dimension the pearl pen gave to it. Thanks Maria! The faces were in my subconscious I guess! Beautiful end result. Looking forward to working with this quote. Fantastic piece. Oh... I want to try this. Thanks for the eye candy and inspiration. Beautiful! Love the vibrant colours! Another beautiful city..... that Manhattan skyline is one of my alltime faves of yours, and this is right up there. 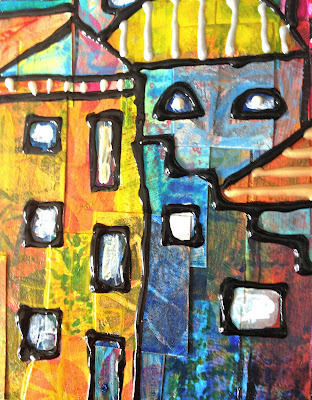 Love how you built this one up with gelli prints. Stunning!! This is beautiful, and the quote is so wonderful. 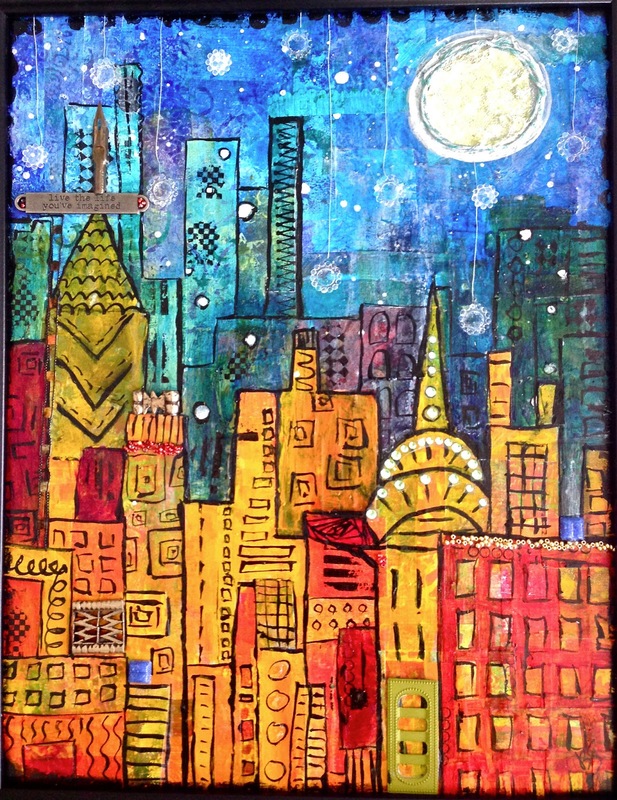 Love the way you used the gelli print, awesome!!! i love your piece, and your results, but most of all, i do love the psalm. enjoy your trip!! I keep wondering if I really need a gelli plate and then I see something totally spectacular like this! Such a dramatic and gorgeous creation! Love the windows and doors! Thank you so much for visiting me and I am happy to be your newest follower! Enjoy the day! what a really beautiful project Jessica. I love how your gelli plate prints really brightened up your scene! Your houses are beautiful, and so are the qoutes ! I`m one whom feels like Maya Angelou ! !-- Importent to have a place I call home. Your gelli prints are so strong and beautiful in colours- and that you after printing, drawed the houses, looks fantastic Jessica! As I mentioned on facebook ,I have been living in Israel for a year or so, and love the country- I think you will love it too-all the colours for one thing!! Maybe we can meet for a coffee or tea while I'm there! Jessica, I love your creation! It looks wonderful and yes, also I see eyes and faces in the windows and doors! Beautiful! I saw this on face book and had to tell you this is beautiful.I have many calenders from Israel many with pictures similar and every time I see something as beautiful as this I smile. EXCEPTIONAL!!!! I wondered how you did the NYC piece, and now I know! Just gorgeous!!!!! PINNING! 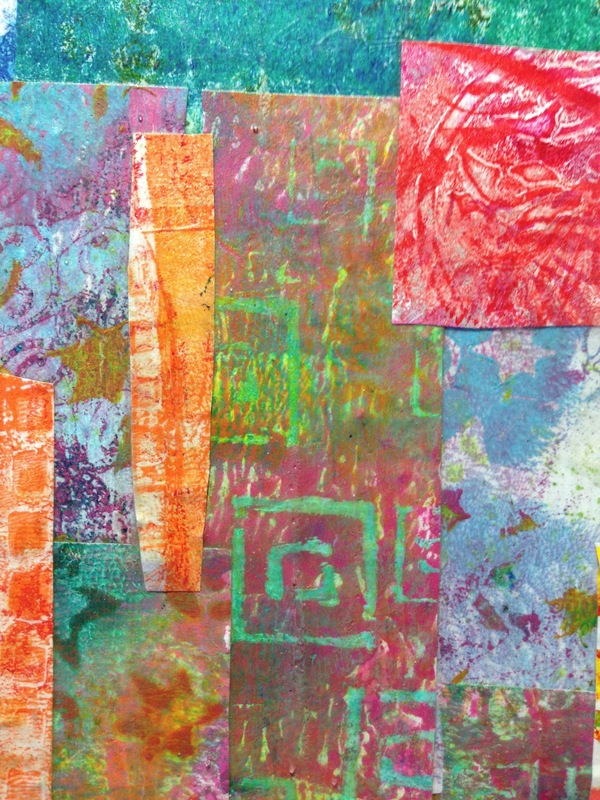 Love that it is an assemblage of your Gelli prints! Your Jerusalem paintings are so beautiful. I think what I like the best is the vivid colors. 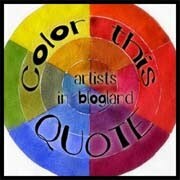 You are definitely not afraid to use color boldly and your paintings are so gorgeous because of that. So beautiful. 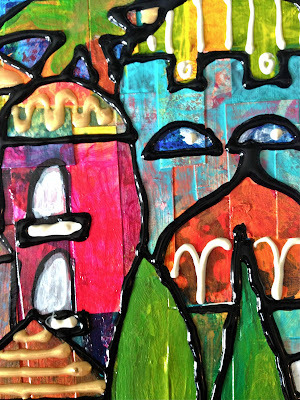 I love seeing how you used your gelli prints. Beautiful Jessica! Your buildings have such a joyous feeling! Thanks for sharing with the party! Loving the wonderful colours and the style of your works Jessica. Beautiful page. I hope you enjoy your visit abroad this year. This is beautiful!! I am so glad I got to see it because of the Gelli Arts link party! Beautiful beautiful page and quote Jessica! This is the best message ever and one I live by!! My favorite art always had bold black lines in it!! This is gorgeous! !Thanks for this post!! I absolutely love this piece - I really like the technique you used to create the gorgeous background and that pen you used to outline the buildings that gives a great 3D appearance - I want one!! fantastic artwork. So vibrant and full of yummy texture. I love your outline pen, it reminds me of icing! Aw I would like to there, looks do happy and full of peace. Thanks for sharing your technigue. they do! Thank you so much. 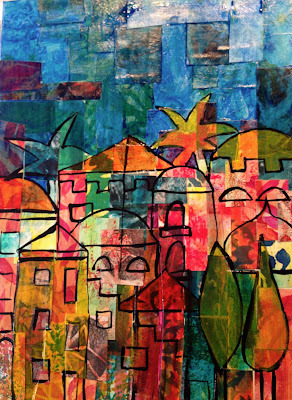 love love love the vibrant colors and the jubilant buildings! I love it when other artist show their process. Neat! Wonderful artwork, and thanks for all the info on how you made it. Totally amazing piece of work, Jessica. I love the meaning behind it and how you have included the verse from Psalms. Home indeed is the best destination. Thank you so much for sharing this lovely piece with us at Frilly and Funkie. Love how colourful this is! It just draws me right in as if I'm walking the streets of Jerusalem. 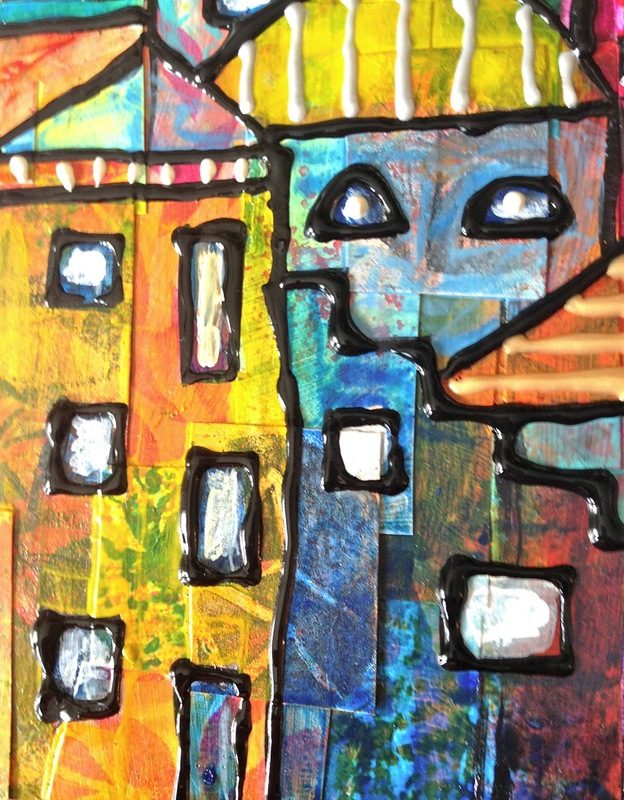 I love the vibrant colors and seeing the collage "underneath" before you outlined the buildings. So cool! 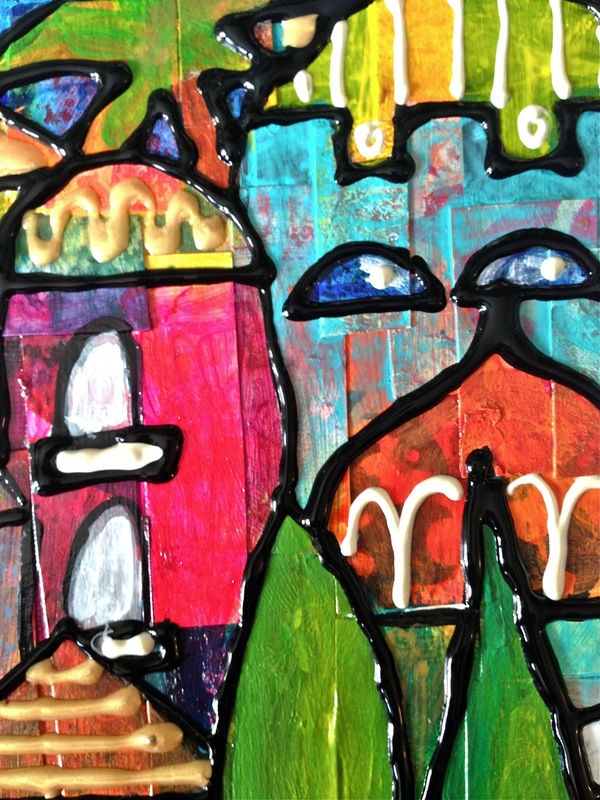 I love your Gelli artwork with all the windows and walls. Thanks so much for explaining how you did it. Beautiful collage! 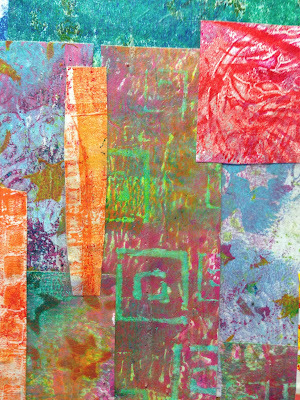 I really like the gelli prints you used to make it all come together. Great job! Such a beautiful presentation along with the quote! I love the techniques you used and the bright colors! I could look at this all day!! Thanks for playing along with us at Frilly and Funkie! Love it Jess!!! The dimension is awesome as well as the color! thanks for sharing your process! Truly wonderful! 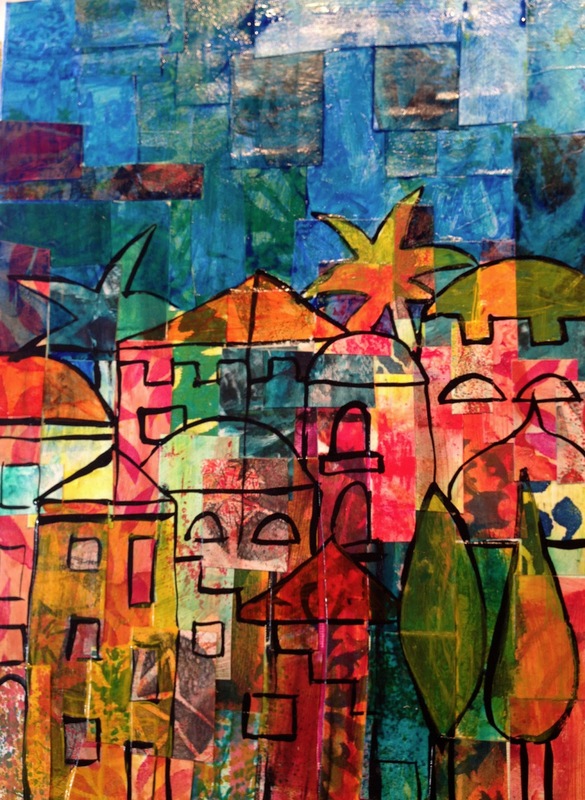 Such vibrancy and dimension - your Jerusalem piece makes my heart happy just looking at it. 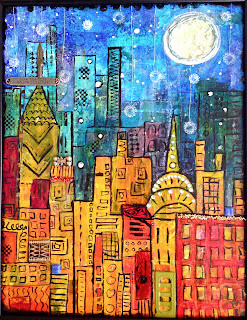 great gelli print background and i love those buildings you've created over it.